Not all dynasties are created by a family, not a genetic one anyway. Some are created by "The Family." In order to be the head of the Mafia, you must be Sicilian, and contrary to popular belief, Al Capone was not and could never be the head because of his lack of foresight. He was born in New York, after all, to non-Sicilian parents. But Al didn't let something as simple as an accident of birth prevent him from becoming one of the most powerful men in America. Before there was Al Capone, there was "Big Jim" Colosimo. Big Jim was the undisputed boss of Chicago in 1902. He owned a string of gambling dens and brothels. He was ruthless and powerful, but like anyone else, he had his Achilles heel--or, in Jim's case, two of them. His head was turned by a pretty young thing. Eventually he left his wife and, in 1920, married his latest crush. Like many men with a new trophy wife, Big Jim lost interest in the day to day running of his empire and started turning much of his power over to underlings. The second thing, which, combined with his new wife, resulted in his downfall was Big Jim's refusal to see a golden opportunity to expand his kingdom and make a lot of money for a lot of people. When Prohibition began in 1920, any entrepreneur willing to ignore that nasty 18th Amendment was destined to make a whole lot of money with bootleg liquor. When Big Jim's second in command, Johnny Torrio, presented him with his new business plan, Big Jim didn't see the need to expand his financial horizons, satisfied with the profits being made by gambling and prostitution. Besides, starting up a new branch of business would take away precious time he'd rather spend with his new wife. Not one to take no for an answer, the charming Mr. Torrio took matters into his own hands. Torrio informed Colosimo of a shipment being delivered to one of his cafes. While Big Jim was there awaiting delivery, he was shot and killed, presumably by Frankie Yale, an associate of Torrio's, though neither was ever convicted. In order to promote peace in the city, Big Jim had attempted to divide Chicago up between its various gangs, each outfit taking a section of the city for their own business purposes and leaving the other sections alone. Johnny Torrio wasn't a big fan of this plan, and when he took over upon Big Jim's death, bitter squabbles between the different factions erupted, elevating into full out gang wars. To help him strong arm control of the city, Torrio called on his good friend from New York, Alphonse Capone, to lend him a hand. 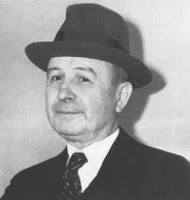 Al was an ambitious young man and soon made himself indispensable to Johnny Torrio. Soon Al had a grasp of Chicago gangland politics, which worked to his advantage when, just a few years after Al arrived in Chicago, Johnny Torrio suffered an assassination attempt by a rival gang. Though Torrio survived, he was shaken enough to turn over the reins of his empire to Capone. Johnny became one of those rarities, a gangster who died of old age. He lived quietly in Europe for five years before returning to the U.S. to become somewhat of an elder statesman for the U.S. Underworld. He died in 1957 at the age of 75 after suffering a heart attack. Which brings us back to Al. He finally got what he so desperately worked for all those years--control. His control became absolute when he took power over the mafia. Though he could not be its head, as was stated earlier, he could and did, place a puppet leader at its helm. Al Capone was now at the top of the world and his empire complete. In 1931, Al was convicted of tax evasion and sent to prison. Though a successor took his place as leader of Chicago, with the ending of Prohibition, along with the concerns of the Great Depression, the time of the celebrity mobster was over. Soon they were replaced by the likes of Bonnie and Clyde and John Dillinger, loners with no obvious gangland ties. Though the mob is still going strong today, it tends to lay low and doesn't flagrantly flaunt the law out in the open as their predecessors did. When Capone fell, his kingdom went with him.